I want to pretend that this granola is worth getting out of bed for in the morning. But, frankly, there's not a whole lot that can motivate me to crawl out from under the cool sheets except for summer camp start times and giant cups of coffee. But once that's all said and done, and the boy is off having fun for the day and I'm fully caffeinated, I'm finally able to appreciate this granola in all its glory. I'm not a huge fan of raisins -- nature's little cavity makers -- so I opted for dried strawberries and cocoa nibs instead, and holy moly, aren't I glad I did. And there are no nuts as per usual since my epi-pen just expired. You can add in all the nuts you'd like, though! The greatest thing about this recipe is how utterly forgiving it is. This morning I ate the last of it while watching the window washers scale down the high rise next door. Could you do that job? I don't think I could do that job. I've jumped out of airplanes, but something about being suspended at the mercy of potentially incompetent coworkers while I scrub glass clean enough for birds to smush into again five minutes later doesn't appeal much to me. I used to live in that building on the 26th floor -- yes, I moved to the low rise next door and if I look way, way up I can see my old apartment. I remember when the window washers would come, bouncing and dripping soap past my window, and how weird it was to see things and people so high up with me. My feet on solid ground and everything else floating or suspended. Like when bees would fly into my suite, and I'd wonder what they were possibly doing there when the plants were about, oh some 20 plus floors down. But now I'm back on the ground, in the land of spiders and less adventurous bees and delicious granola that can be eaten while lazing around in my little yard, looking up at a view that I miss. Preheat oven to 225F and set aside a large baking sheet. Mix the oats, pumpkin seeds, sunflower seeds, spices, and quinoa in a large bowl. Stir in the syrup, and pour the mixture into an even layer on the baking sheet. 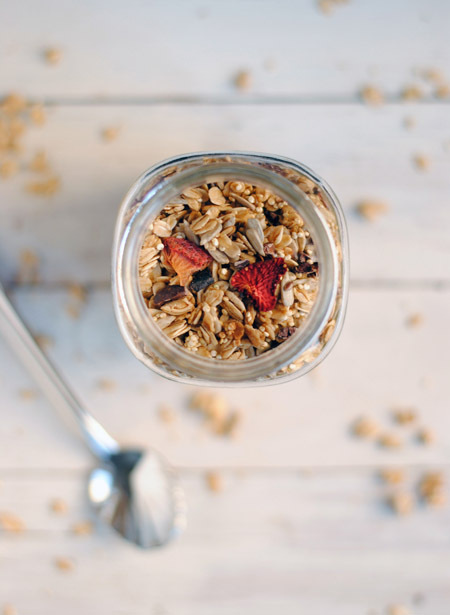 Bake for 1 to 1 1/2 hours – the granola should be slightly crisp and toasty warm. 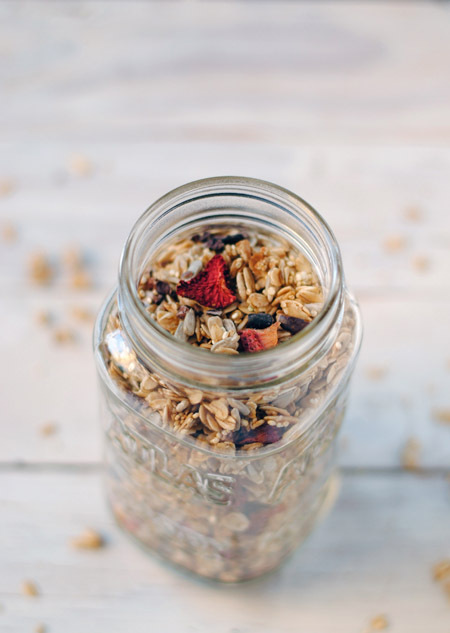 Allow to cool then transfer the granola to an airtight container and toss with the flax seeds, cocoa nibs, and dried strawberries. Serve as-is, over granola, or with milk. If you have a dehydrator, go right ahead and pop the strawberries in there instead. If you don’t have a dehydrator, you can use the oven method like me. Preheat oven to 200F and line a baking sheet with parchment paper. Wash, dry, hull, and slice the strawberries and lay them flat on the baking sheet. Pop the tray in the oven and bake for 3-6 hours, checking every 30 minutes or so to see if they're dry yet. Mine took about 3 1/2 hours. Once they’re done, remove them to a cooling rack and store in an airtight container.